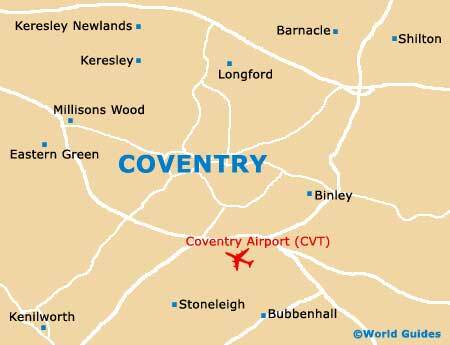 There are literally hundreds and hundreds of acres of landscaped gardens and spreading parklands on offer in and around the city of Coventry. 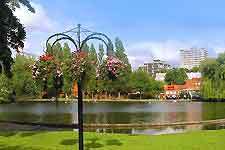 Areas of green close to the city centre have long been an important part of life in Coventry and amongst the most centrally located are the Garden of International Friendship, Greyfriars Green, The Peace Garden, the Priory Gardens and also the War Memorial Park. Close to central Coventry, the Coombe Country Park along Brinklow Road is known for its large lakes lined with huge trees and pathways, while the Ryton Organic Gardens at Ryton-on-Dunsmore offer events and family fun all through the year. Here are Coventry's main parks and gardens. The gardens at Coombe Country Park are well worth a visit and feature formal landscaping at its best. With clipped hedges, topiary, flower beds, wooded areas, mature trees, spreading lawns and lakeside trails, this country park is vast and covers around 400 acres / 160 hectares. A modern and extremely stylish garden with plenty of interest, Coventry's Garden of International Friendship stands close to the historic city gates and despite its bold and somewhat contemporary appearance, the gardens provide a peaceful, quiet place to relax, away from the hustle and bustle of the nearby crowds. Greyfriars Green can be found in the very centre of Coventry and was first laid out and structured during the 1850s. This tranquil city park is close to a school attended by acclaimed Victorian novelist George Eliot. During the summer months, swathes of bedding plants fill the gardens with bright colours. Hidden away and next to the Herbert Art Gallery, the Peace Gardens are located within Coventry city centre itself, next to the University Square. The gardens was built to remember the devastation caused by the blitz bombings in the Second World War and feature an interesting central plaque with a list of all Coventry's many twin cities and their respective distances. Enjoying a central location and new found popularity, the Priory Gardens are the perfect spot for a short rest, and are surrounded by some of Coventry's most impressive buildings and structures, including both the Holy Trinity Church and also the Blue Coat School. The gardens stand on the actual site of the city's first ever cathedral and are fairly formal in style, with plenty of seating areas suitable for an impromptu picnic or sandwich. The biggest park in the whole of Coventry, War Memorial Park dates back to the early 1920s and commemorates those who fought and lost their lives in World War I. Covering approximately 120 acres / 50 hectares, the War Memorial Park is dominated by the towering stone memorial itself, which was built in 1920. Other attractions within the park include water features, playing fields suitable for a range of sports, tennis courts, bowling greens, a short 18-hole golf course, and historic pavilions with classical architecture. The park also features a shop serving a range of refreshments and each year hosts the extremely popular Godiva Festival. Each year, the Ryton Organic Gardens offer an extensive calendar of events and seasonal activities, suitable for all of the family. Just a short distance from Coventry city centre, the Ryton Organic Gardens has become the country's main centre of organic gardens, and a particularly noteworthy attraction in its own right. Much more than just organic vegetables, these gardens contain plenty of colour all through the year and are at their most fragrant during the summer months.